I've decided that BARK OUT LOUD will be the running title of the end of the week summary series. I'll be headed back to the previous summaries and tagging them appropriately, so that they're easier to track down. Our CP (Cover Pooch) this week is Lavergne. She's been in the foster system for many months now and asks nothing more than a nice soft spot on the couch to sit with you and follow you around. 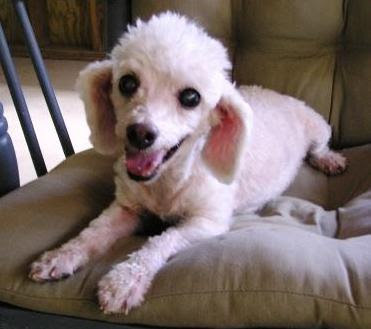 Check out Senior Pooch Adoptions for more on Lavergne and lot of adoptable senior dogs. Several new dogs are being added today that urgently need you help. This week we dove into how our friend, Ann-Marie Fleming is making life easier on older dogs and their parents with products she has designed at DogQuality.com. You'll really want to check out the videos on the site to understand just how much care and understanding go into her product lines. Short time SeniorPooch.com adoptable mutt, Domino, found a great family this week. Finally, I'm attending my first event as a volunteer with The Dog Squad at the Petco in San Marcos, California. Here are the details, including just a few of the adoptable dogs we're bringing with us. I'll have more on my experiences on this next week.